Home » Destinations » North America » USA » Sandusky Ohio: A Guide to Visiting the Shores, Islands, and Cedar Point! Jess and I have explored a great many parts of her home state of Ohio in the United States. We’ve now visited nearly every corner of the state and have seen a lot (including all the best waterfalls in Ohio! ), and we’re looking forward to sharing it with you. In today’s post, I want to share with you a suggested itinerary for visiting one of the more popular parts of the state – the Lake Erie Shores and Islands, which we were invited to visit by the Shores and Islands tourism board on one of our trips to Ohio. 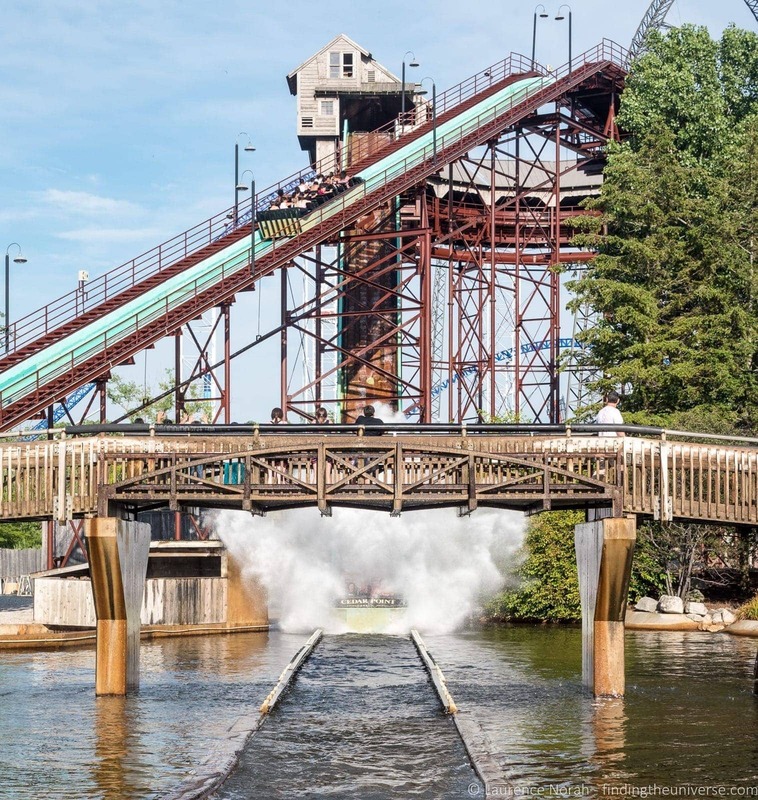 Centred around the town of Sandusky on the northern edge of the state by Lake Erie, the Shores and Islands offers everything from a world famous amusement park through fine dining and island exploration. This three day itinerary we’ve put together would be perfect for a long weekend or just a three-day midweek break. You can do it in any order you like of course – although we’d suggest setting it up so you visit Cedar Point on a less busy day, so try to avoid weekends or holidays if you can. Also be aware that school holiday periods will be busier in general. Now, let’s take a look at our suggestions for visiting Sandusky Ohio and surrounds over three days. 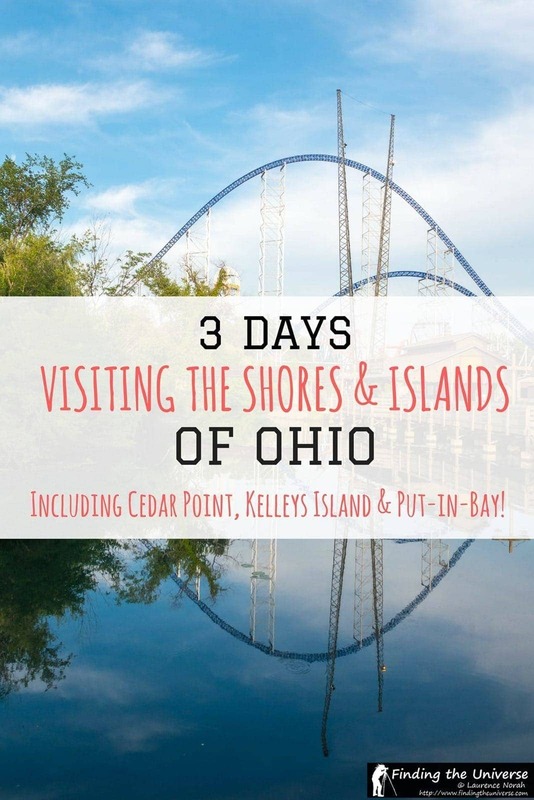 This includes a detailed guide to what to do in Sandusky, what to do on the shores and islands, and a guide to getting the most out of your Cedar Point visit. 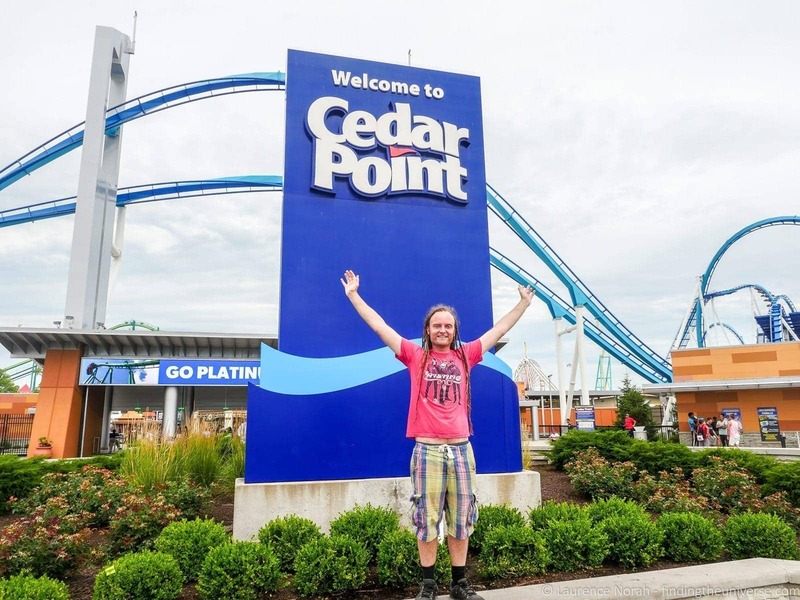 Day Three – Cedar Point! Our first day has you exploring the town of Sandusky, where there is plenty to occupy you. Here were some of our favourite things to do in Sandusky and surrounds to give you some ideas for your first day. 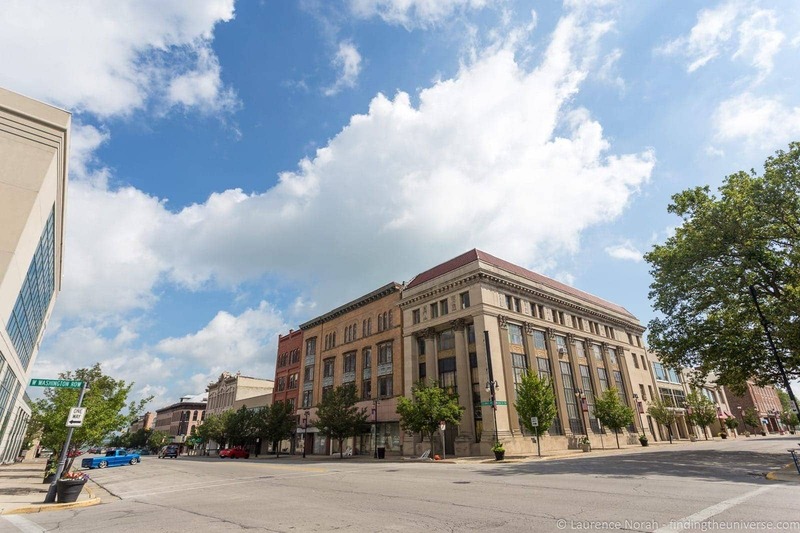 Established in 1818, the town of Sandusky has plenty of old buildings and pretty streets to occupy your time with a wander, as well as a number of cafes and restaurants where you can stop in to refresh and revive. If you’re interested in a detailed walking tour, the Erie County Historical Society website has an excellent suggested walking tour of Sandusky with a number of stopping points that you should definitely check out. If you’re a lover of old-time amusement park rides, then a visit to the Merry-Go-Round Museum in Sandusky is a must. Here you’ll find everything you ever wanted to know about carousels, including a number of hand carved wooden figurines and a full, working, original 1939 Herschel carousel that you can take a ride on. 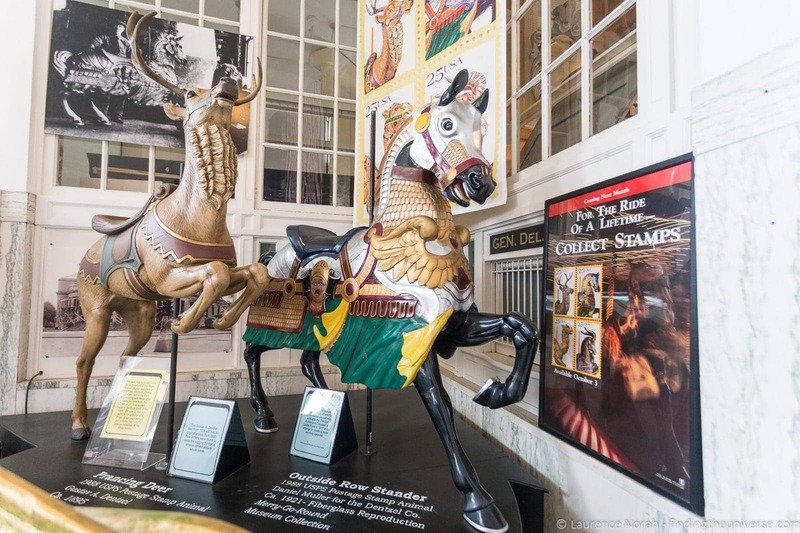 The museum is also home to a number of master carvers who both create and restore carousel animals, and you’ll learn all about their historically accurate processes when you take the tour. If you’re interested in learning all about Sandusky’s Maritime history, then you should definitely include a visit to the Sandusky Maritime Museum on your itinerary. The museum houses all sorts of exhibits about the fishing, boating and shipping activities on Lake Erie, as well as having information on boat-building and wetlands. There’s even an exhibit about Sandusky’s role in the Underground Railroad. A short drive south of Sandusky will take you to the small town of Milan, which is famous as being the birthplace of the inventor Thomas Edison. Today, you can visit the home where Edison was born, the Thomas Edison Birthplace Museum and learn all about the early life of the man who invented hundreds of things we take for granted today – everything from lightbulbs to phonographs! The museum has to be visited as part of a tour, and as well as touring the house where Edison was born and raised, you’ll see examples of Edison’s early inventions, some of his documents, and family mementos. 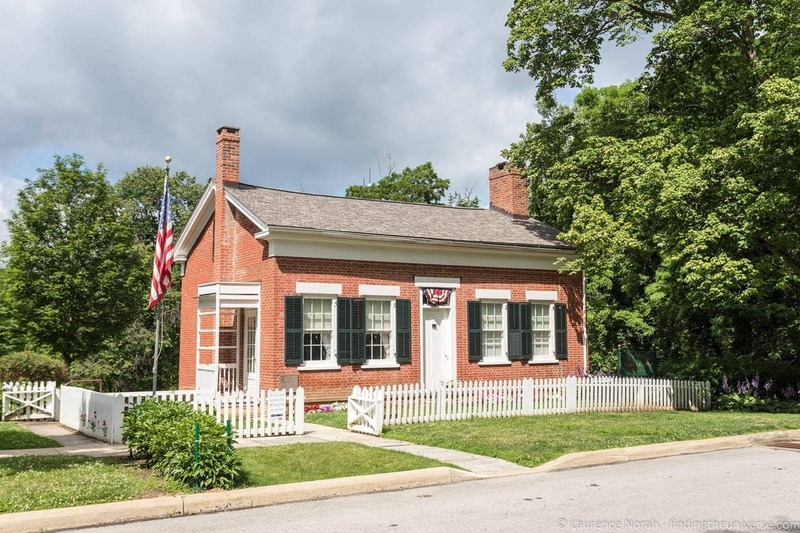 To learn all about the history of Sandusky and surrounds, look no further than Follett House Museum. Here you’ll find everything you ever wanted to know about this area, from before the War of 1812, through to the Civil War and right up to the present day. Located in Follett House (a National Historic Landmark) and spanning four floors, you’ll find everything here from information on Presidential visits through to the industries that have driven Sandusky through the years, told through documents, photographs, maps, and more. One of the wonderful things about this part of Ohio is the huge expanse of Lake Erie that forms the northern border of the state. 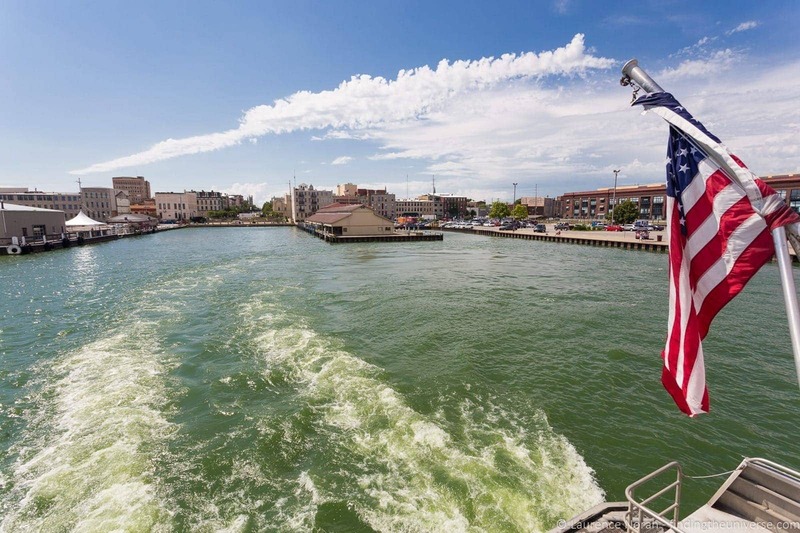 And sitting in Lake Erie are a number of islands, which are an easy boat ride from Sandusky using the Jet Express ferry service – which was exactly what we did. We spent a day exploring two of the islands, Kelleys Island and South Bass Island, which is usually referred to as Put-in-Bay, the name of the main town on the island. You can definitely do both of these islands in one day, although there’s also more than enough to do on each island to fill a day, so it’s really up to you. 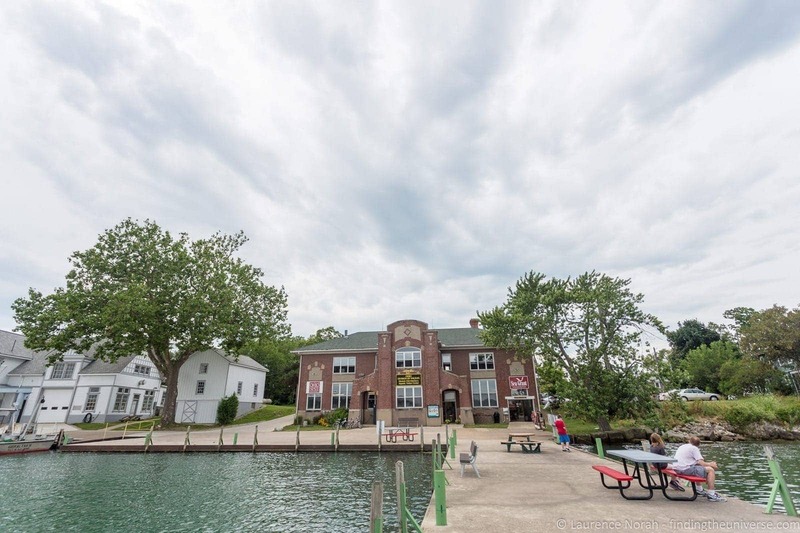 In our opinion, Kelleys Island is the more laid back of the two islands, and Put-in-Bay is where you’ll want to head if you’re looking for a party. On both Kelleys Island and South Bass Island we rented a golf cart. There are very few cars on either island, and if you want to do some sight-seeing then we highly recommend either a golf cart or a bicycle – both of which can be hired near the ferry ports. On Kelleys Island we used Portside Marina, and at Put in Bay we were actually lent a golf cart by the local tourism office. However, there are a number of operators so you’ll be able to easily find one! Golf Carts are super easy to drive and they’re road legal. There’s not much traffic, and you’ll be able to get from location to location much more quickly when using a gold cart. 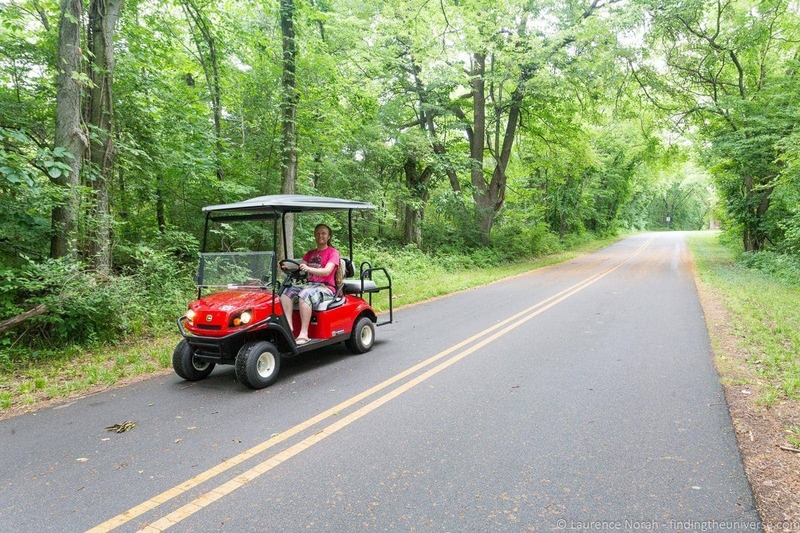 Do be aware though that the rules of the road do apply when driving a golf cart, and in particular the drinking and driving limit is still enforced for golf cart drivers, so you’ll still need a designated driver! 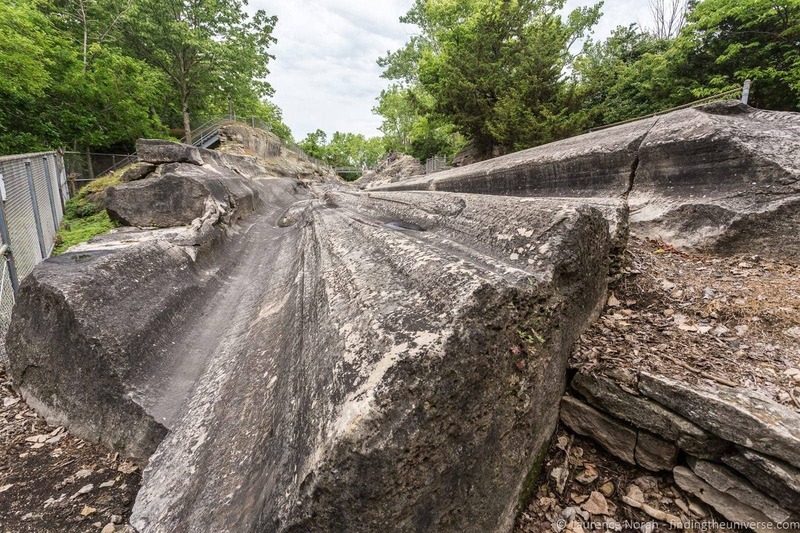 A remarkable natural feature, these rock grooves were formed by the movement of ice across the limestone around 20,000 years ago. They’re found around a mile and a half north of the main town on the island (you’ll appreciate that golf cart), and you can walk all around the grooves on the well marked trail, which also has information signposts. These grooves are in fact the largest and most accessible of their kind anywhere in the world, and as they’re so easy to get to we definitely encourage you to check them out. It’s hard not to be impressed by the power of ice against rock when you see them first hand! Nearly a quarter of Kelleys Island is given over to Kelley’s Island State Park, which covers 677 acres. 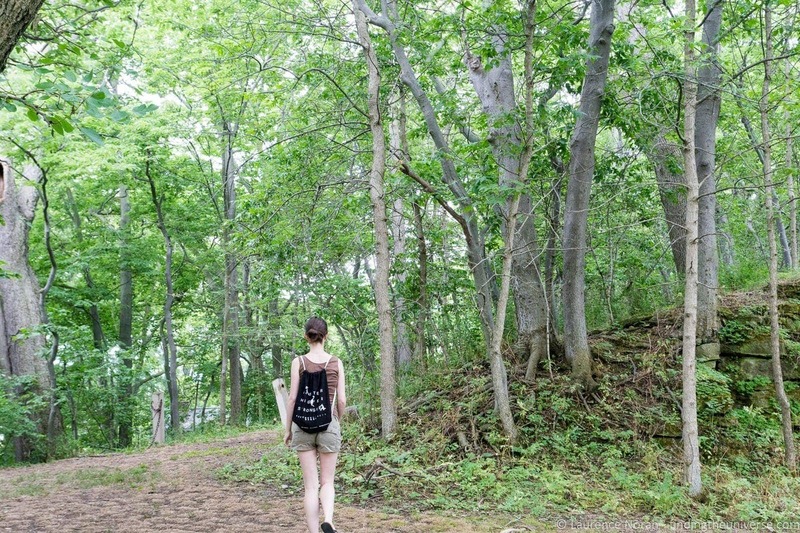 In those acres, which include both lakefront and forested interior, you’ll find six miles of hiking trails which are perfect if you’re looking to stretch your legs. The island is pretty flat, so you shouldn’t tire yourself out, but this is a lovely and peaceful way to get back to nature and relax. There are numerous historical properties on Kelleys Island, and in fact the entire island is on the national register of historic places. Just wander along Division Street, and you‘ll come to the Old Stone Church and Estees School, with many more historic homes and businesses found throughout the island. 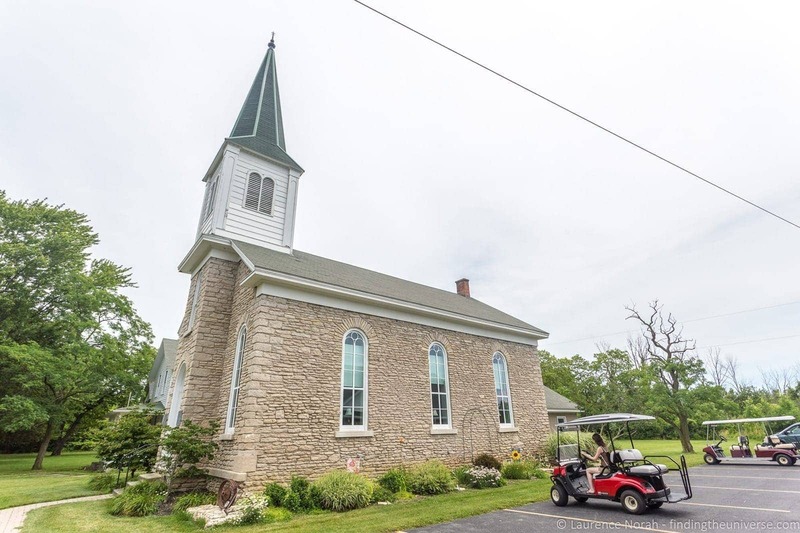 If you’re interested in learning more about the history of the island, you can visit the Old Stone Church, which is now home to the Kelley’s Island Historical Association. You can also pick up the Kelley’s Island Tour guide, prepared by this association, which is available at various gift shops on the island. If you’re feeling a bit more active, one good option is to hire kayaks and take to the waters. 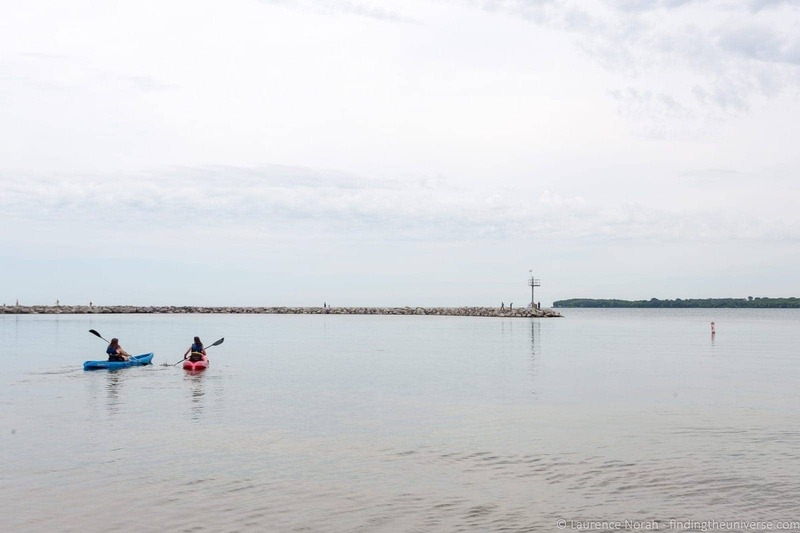 Kayak’s can be hired on State Park Beach, which is just a short walk from the Glacial Grooves. They also offer stand up paddle board rentals. If you’re after something a bit more exciting than Kayaking, you will probably want to head to South Bass island, where you’ll find numerous water activities including jet-skiing. If you’re not feeling active, no worries. You can just relax on the beach instead. 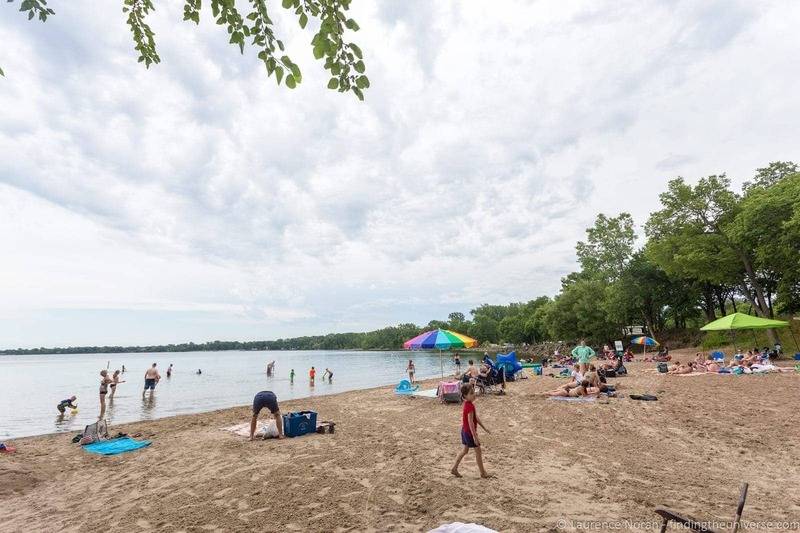 Kelley’s Island State Park beach is the main public beach on the island – there are other beaches but they are privately owned so off-limits to visitors without specific permission. Once you’ll all done with sight-seeing (there’s lots more to do on Kelleys Island – see their official website for more ideas), you will either hop on the boat home, or, if you’re going to fit both islands into the same day, take the boat across to South Bass Island and continue the adventure! If you’re doing this itinerary to include both islands in one day, then you might find yourself getting hungry at this point. We recommend you satisfy your hunger with some of the local fish. 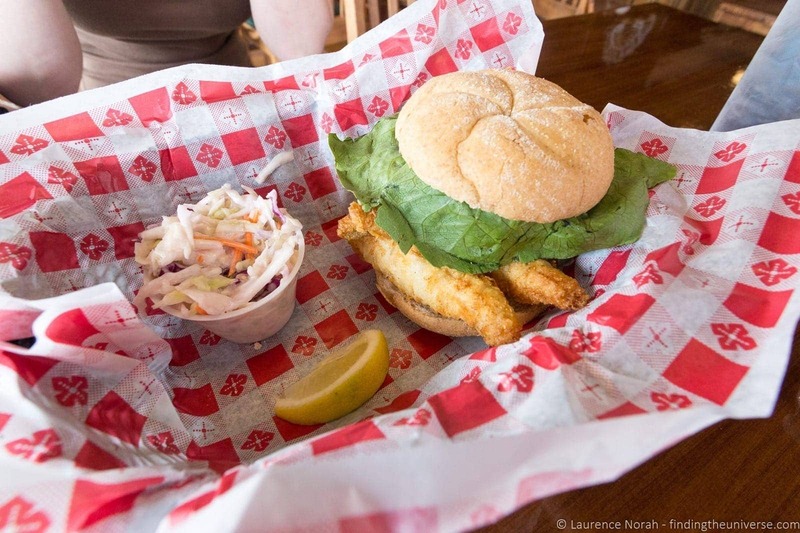 As you wander around the various eateries, you’ll probably notice Lake Erie Perch and other local catches being advertised. This is a freshwater fish, officially known as Yellow Perch, and is most commonly served breaded and fried in a sandwich with various accompaniments. Not to be missed. Lake Erie, and its islands, were the site of a major naval battle during the War of 1812, between the United States and the British. Despite the name of the War, the battle itself took place on September 10th, 1813, and involved six British ships and nine American ships. Despite lesser numbers, the British had the advantage due to having much longer range guns on their ships. The battle itself was fierce and brutal, with losses on both sides. However, the American side prevailed, and managed to capture six of the nine British vessels, with the remaining boats either sunk or damaged beyond repair. If you’re interested, you can read a full depiction of the battle itself here. 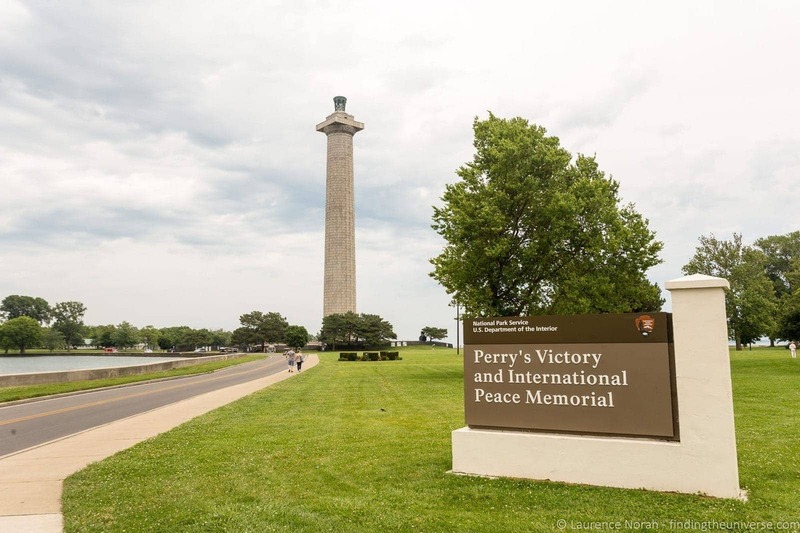 In Put-in-Bay, you can visit Perry’s Victory and International Peace Memorial. 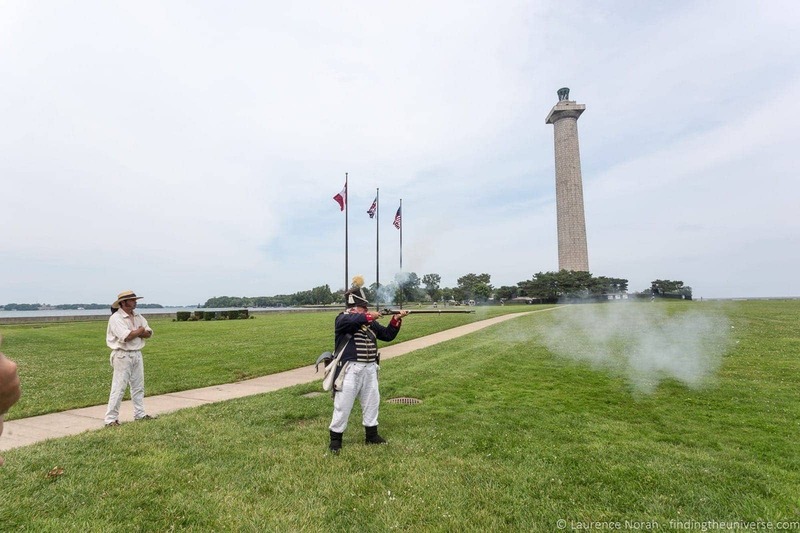 This consists of a 352ft high monument, as well as a visitor centre, where you can learn all about the battle of Lake Erie, as well as Master Commandant Oliver Hazard Perry, commander of the US ships during the battle, and for whom the memorial is named. There are also often talks and demonstrations here and we watched a fun talk about the war on the lawn outside the visitor center which included a musket firing demonstration. The memorial itself celebrates the long peace that has existed between the US, Canada, and Britain, and is symbolically located five miles from the longest undefended border in the world. 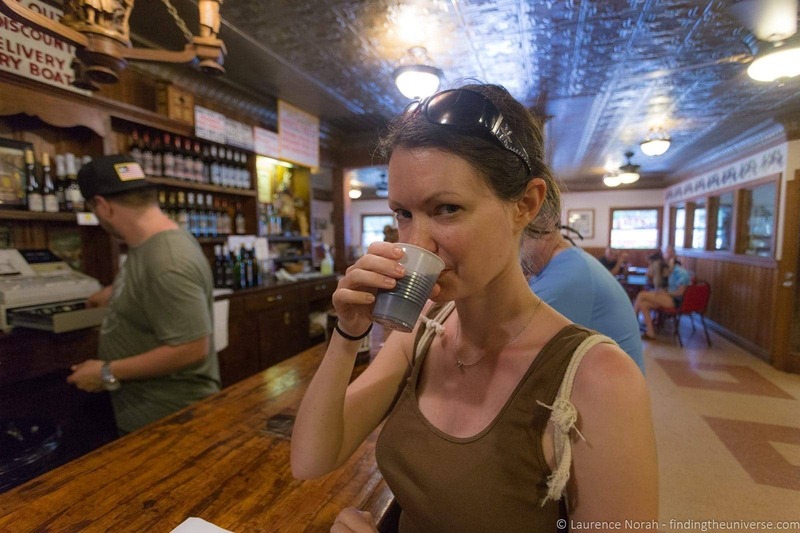 It was definitely a highlight of our visit to Put-in-Bay, and we highly recommend you stop by. Ohio has been producing wine since the 19th century, and for a time was the leading wine producer in the United States. After the American Civil War though, and following a number of crop-disease outbreaks, wine production had virtually died out. It has however had a resurgence, and the German immigrants who moved to the islands of Lake Erie at the turn of the 20th century certainly helped Ohio’s wine production renaissance. With this in mind, we feel that no visit to the Lake Erie islands would be complete without taking in a tour of the vineyards and a spot of wine tasting. There aren’t quite as many vineyards as you would have found a hundred years ago, however excellent wine is still produced on the islands, and you can sample the produce at both Heineman’s Winery, which is a very popular spot, or in town at the Put-In-Bay Winery. Both locations offer wine tastings for reasonable prices, and Put-in-Bay winery also includes a tour of the property and estate during the tasting. 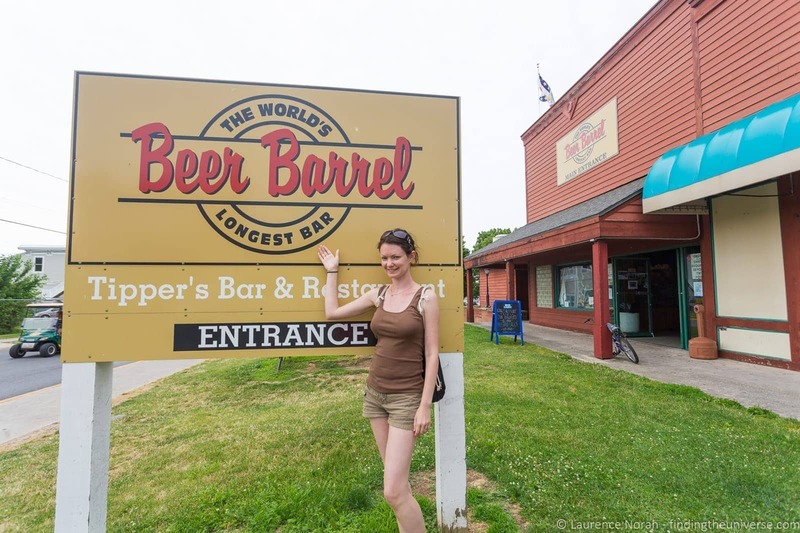 It’s not just enormous bars that are record breakers on South Bass Island. 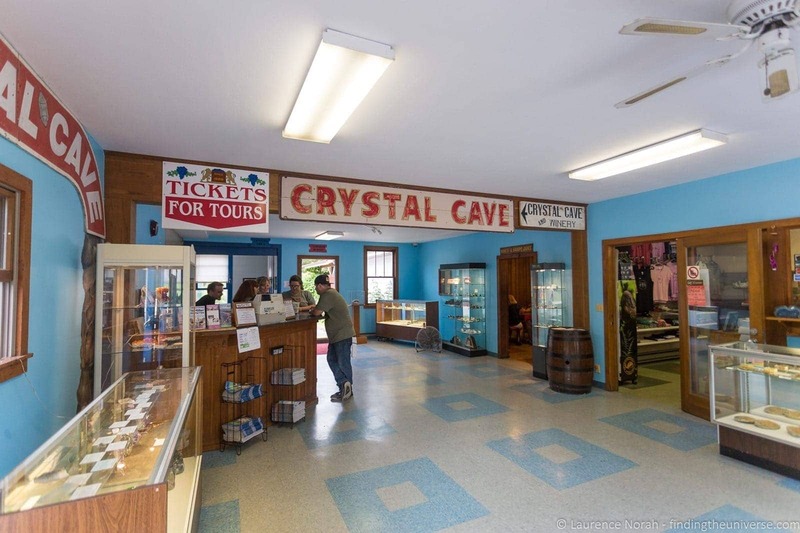 If you visit the Crystal Cave, part of Heineman’s Winery, you’ll be able to step inside the world’s largest geode! This geode was discovered in 1897, when workers at the winery were digging a well in order to water the vineyard. Found 35ft below ground and around 12,000 years old, the Crystal Cave is in fact one giant geode that you can step inside. Since it’s discoverery it has been a popular attraction for visitors to the area, and you can combine a bit of wine tasting with a tour. The income from visitors visiting the cave has even helped the winery survive when times were harder, such as during Prohibition! Jess’s favourite ride at every fairground we visit is always the Carousel, and Put-In-Bay is home to a gorgeous original 1917 Herschel carousel with wooden animals – everything from the classic horse through to chickens, pigs, roosters, and, of course – a Perch! Rides are excellent value and are a lovely way to experience a bit of nostalgia for when fairground rides were somewhat more laid back. Last on our list of fun things to do in Put-in-Bay and South Bass Island would be a visit to the Aquatic Visitors Centre. Operated by the Ohio Division and Wildlife, this building was once home to the state hatchery, and countless millions of Lake Erie fish were hatched and raised to a viable size here. Today, the centre serves as a knowledge centre where you can learn all about the marine life living in Lake Erie and around the islands. It also has fishing gear you can borrow, free to children under the age of 16, which makes it a lot of fun to visit for the whole family. Definitely worth checking out when visiting Put-in-Bay! One thing that Put-in-Bay is definitely known for is having a good party scene. And what better way to start of your party then with a drink at the bar which hold the Guinness World Record for having the longest continuous permanent bar in the world? With 405 feet of bar surface to choose from, you shouldn’t have too much difficulty finding a spot to get served at the Beer Barrel Saloon. And with plenty of food and drink to choose from, we’re sure you’ll keep yourself entertained for a while. There are several other popular bars within walking distance and you won’t have any trouble finding a place to drink. And that summarises some of our favourite activities on Kelley’s Island and South Bass Island! There is plenty more to do than the list above, and you could easily spend a weekend or more on either island by itself. But we’re heading back to the shore to relax now, before a fun filled day on our third and final day! 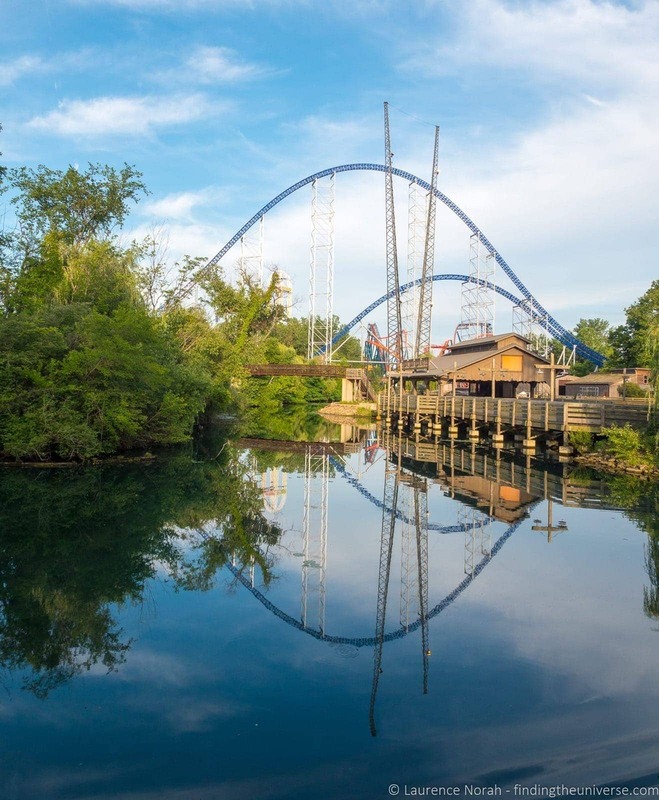 Our last day in the Sandusky area has you going to Cedar Point – one of the world’s most famous amusement parks! Cedar Point has more rides than any other amusement park in the world, which includes no less than 16 roller coasters. It won best amusement park in the world for 16 consecutive years running, and holds all sorts of records for its rides. In business since 1870, Cedar Point really has something for everyone. Jess isn’t a huge fan of the really big rides, but we found plenty to do for both of us when we visited. Naturally I did go and experience some of the biggest rides in the park, with my favourite being Millennium Force, which when it opened was the world’s highest and fastest. Of course, records like this tend to get broken very quickly as parks try to outdo each other, but the ride is still a real thrill. Beyond the roller-coasters, as I mentioned before, there’s really something here for everyone. From water rides to a beach, a petting farm, glass blowing demonstrations, an award-winning dedicated kids area with plenty of smaller rides, live entertainment, as well as restaurants, bars and even face-painting, you won’t find it hard to stay entertained all day. Jess really loved visiting the older part of the park, the classic rides, and learning about its history. The beach is accessible from the park although is not on the park grounds, so if you visit the park and want to also go to the beach you need to get a re-entry stamp on your hand. It’s also worth remembering that the park has a fun evening schedule on the beach, including beach games, music and a fireworks finale, which lasts from 6pm to park closing. See more on that here. Our main advice for visiting Cedar Point is to try and visit on a quieter, weekday outside of holidays, and to arrive as early as the park opens. That way you will be able to experience some of the bigger rides before the queues start to build up. Alternatively, you could invest in a fast pass, although these are relatively expensive, so really only worth it if you want to ride the biggest rides multiple times, or if it’s a particularly busy day. In addition, the larger rides, especially the roller coasters, can close for safety reasons due to rain and bad weather. Occasionally they also close for maintenance. So do check the weather forecast before you go. You can also download the Cedar Point Mobile App for live information on ride status and queue times. 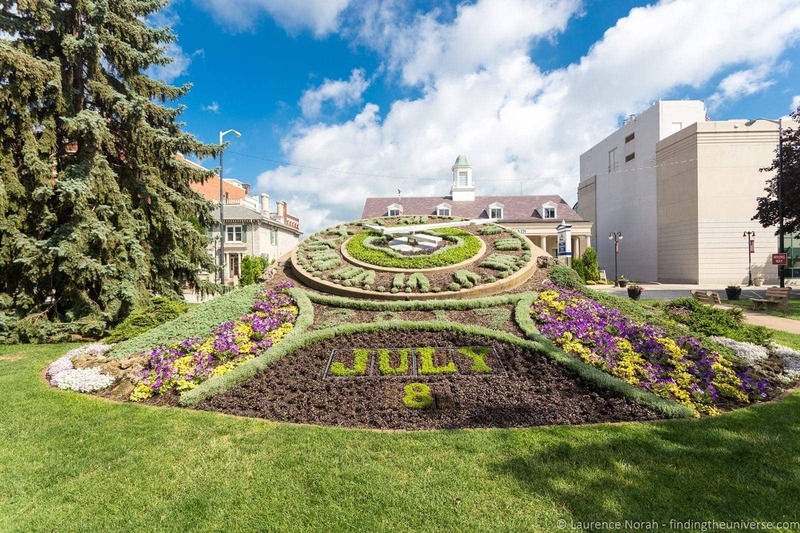 We’d suggest that Sandusky and surrounds are best visited when the weather is warm and sunny – so many of the attractions are outdoors, and you’ll find that more is open over the summer months. 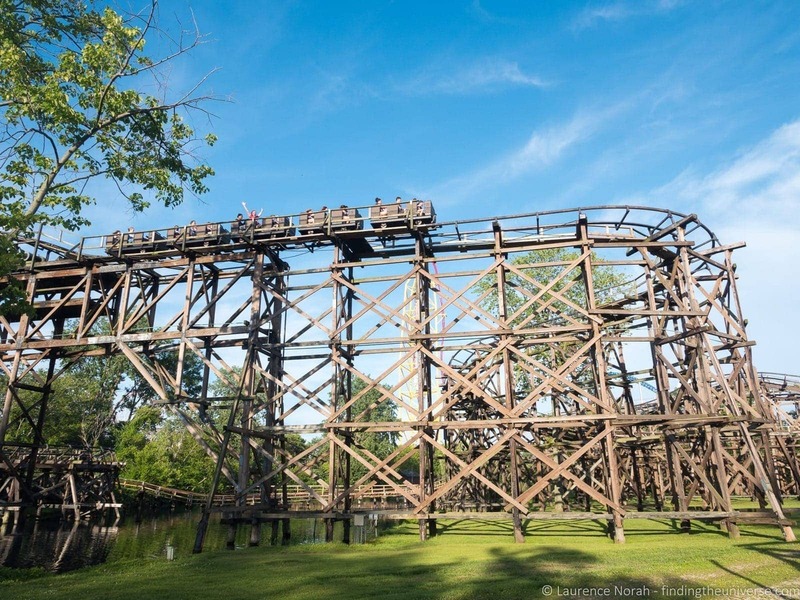 Northern Ohio typically has very cold winters, and many of the attractions in this post, especially on the islands, won’t be open in the Winter months. Overall, either summer, late spring or early fall are good times to visit. Early fall and late spring will be a little less busy than the summer months, although as this is a popular part of the state, it can be busy throughout, and accommodation can book up a long time in advance, especially on weekends and holidays. Late June through to late August are going to be busiest due to school holidays and better weather. There are a lot of accommodation options in the area, including in downtown Sandusky, on the islands themselves and even at Cedar Point. Depending on what your priorities are for your stay, you will want to locate yourself appropriately. 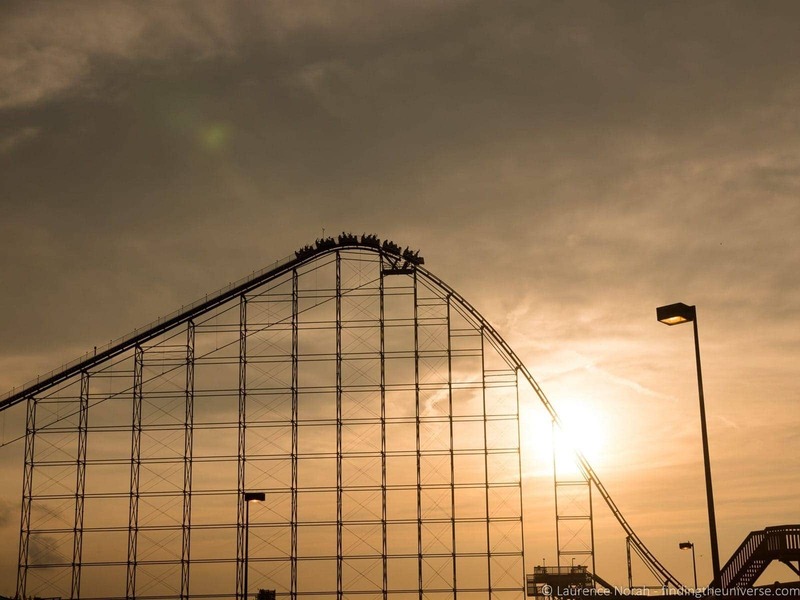 If you’re super keen on visiting Cedar Point for example, you might want to consider being as close to the park as possible to maximise your time there, and also to save on the car parking fees. It’s also worth remembering that some hotels have special packages that include Cedar Point. If you’d prefer to spend more time exploring the islands, then finding a hotel on one of the islands themselves is going to be your best option. Do be aware that despite the availability of lodging, the popularity of this area means that prices are a little higher than other parts of the state, and budget accommodation in particular is hard to come by. This is particularly true during the peak summer months and over holidays. If budget is a main concern, do take a look at some of the nearby towns, including Huron, and the further out Vermilion. We actually stayed at an AirBnB in Vermilion and it was only around a thirty minute drive to all the attractions we visited, including Cedar Point. If you are struggling to find accommodation, or just want some alternatives to the usual options, check out my guide to the best AirBnB Alternatives, which should give you all the resources you need to find the best location at the perfect price. You can also visit the official websites of Put-in-Bay and Kelley’s Island. Want to see more of Ohio? Check out our guide to the best waterfalls in Ohio, as well as our guide to Amish Country, Ohio, our experience visiting The Wilds African Safari Park in Ohio and our guide to things to do in Caldwell Ohio. Looking for some USA inspiration? Check out our two week California itinerary, our guide to driving the Pacific Coast Highway, our Deep South Road Trip itinerary and our guide to Planning a Route 66 adventure to get you started! And that sums up our guide to visiting the Shores and Islands region of Ohio! Have you ever visited this region? 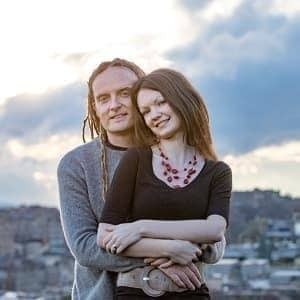 Have tips to share, or questions you’d like to ask? Just pop them in the comments below, and remember, if you enjoyed this post, feel free to share it with your friends! Disclaimer: Lake Erie Shores and Islands supported our trip by providing us with our Jet Express boat tickets, golf cart rental on both islands and Cedar Point entry. We covered all other expenses ourselves, including meals, hire car, parking fees and accommodation. As always, you can see our code of ethics for who we choose to work with and what that means! As an FYI , Miller’s Ferry in Catabwa offers much cheaper ferry service, along with free parking, to Put In Bay than Jet Express. It’s located 9 miles from Port Clinton, and 18 miles from Sandusky. In addition, Miller’s is able to carry your car, whereas Jet Express is strictly for passengers. For 2019 An adult round trip from Port Clinton to PIB is $34. Round trip for an adult on Miller’s is $15.